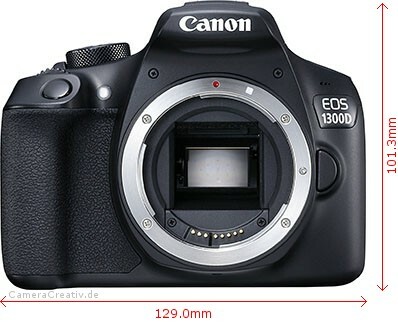 The EOS 1300D was introduced by Canon in June 2016. It belongs to the Beginner DSLRs category. The EOS 1300D features a CMOS sensor in APS-C size that has an area of approximately 22 x 15 mm² (0.88" x 0.59"). The EOS 1300D's image sensor has an effective resolution of around 18 megapixel. That's roughly average and will be sufficient for most purposes. 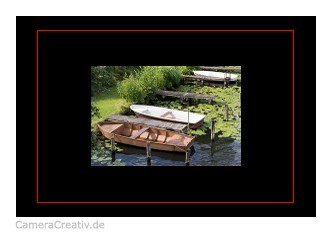 Photos with this resolution can easily be printed to A3 or A2 size. The EOS 1300D does not have a mechanism for automatic sensor cleaning. Dust that collects on the sensor has to be removed with a blower or brush. All compatible EF, EF-S lenses can be mounted to the EOS 1300D. The EOS 1300D uses an optical viewfinder with a penta mirror. Viewfinders with a penta mirror are typical for entry level cameras. The viewfinder covers 95% of the field of view and has a magnification of 0.50x, an average value for a viewfinder like this. The infographic illustrates the viewfinder magnification of the EOS 1300D. The black area represents a magnification of 1x, corresponding to natural size. The red frame indicates the largest viewfinder magnification in any digital camera on the market today (0.85x). Tip: If the viewfinder image of the EOS 1300D is fuzzy, us the little wheel next to the viewfinder to adjust the sharpness. The EOS 1300D's shutter speeds range from 1/4000s to 30s. The EOS 1300D's sensitivity goes from 100 ISO und 6400 ISO, a very useful and practical range. The EOS 1300D supports all common metering modes. The EOS 1300D's auto focus processor uses 9 AF points (or sensors). A basic rule of thumb says that the more AF points you have, the better. More AF points mean a better chance to have a point at the location of interest in a scene, a big plus in challenging situations (e.g. when picking a single face in a crowd). The EOS 1300D features a built-in flash with a range of up to 9m (31 ft.). That range will work for most situations. The EOS 1300D features a monitor with a diagonal of 76.00mm (3.0 in.) and a resolution of c. 0.92 megapixel. That's about average. Unfortunately, the EOS 1300D's monitor is not articulated. That can make it tricky to frame your subject in some situations, e.g. when taking selfies. 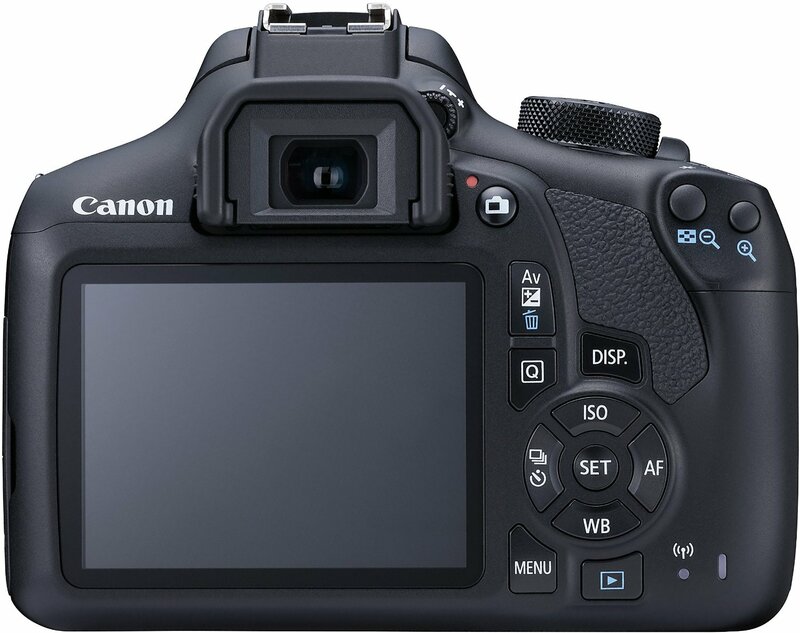 The EOS 1300D does not feature a touch screen. When recording videos with the EOS 1300D, the highest supported resolution is 1920 x 1080 pixel, in other words Full HD Video. 4K videos are not supported by the Canon. The EOS 1300D has Wifi connectivity already built-in. Use Wifi to transfer images to a smartphone or computer and to remote control the camera. With NFC, camera and smartphone can be paired without the need for passwords. In situations where wireless won't work reliably, a wired connection can be used. 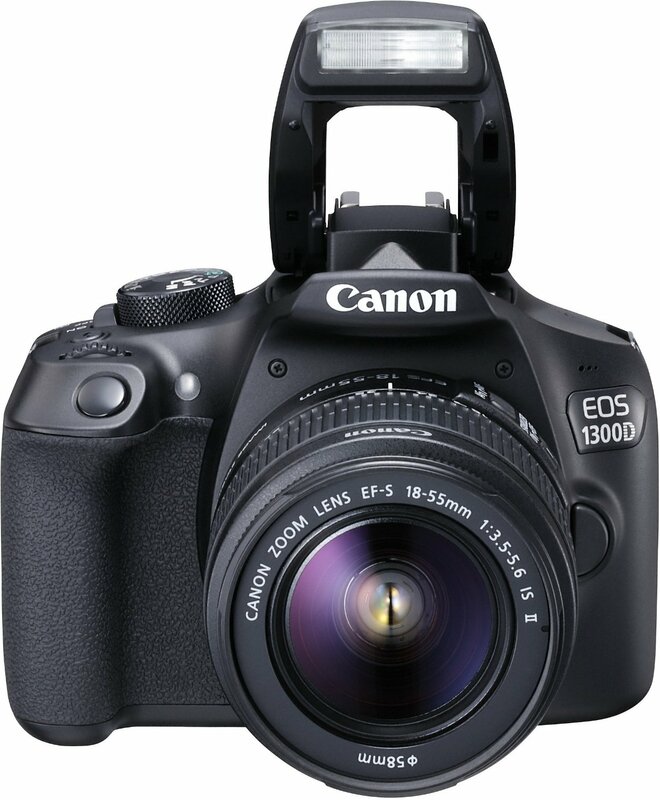 What memory cards can be used with the Canon EOS 1300D? The EOS 1300D doesn't have a built-in GPS receiver. If you want to add coordinates to your photos, you'll have to do so in 3rd party software like Adobe Lightroom. However, with Wifi built-in, location data can also be added via a connected smartphone. The EOS 1300D doesn't have a built-in stabilizer. That would have been a plus when using legacy zooms or tele lenses without stabilizer. When buying a kit with lens, make sure that the lens is stabilized. The EOS 1300D is not environmentally sealed against dust and moisture; keep that in mind in the rain and on the beach. 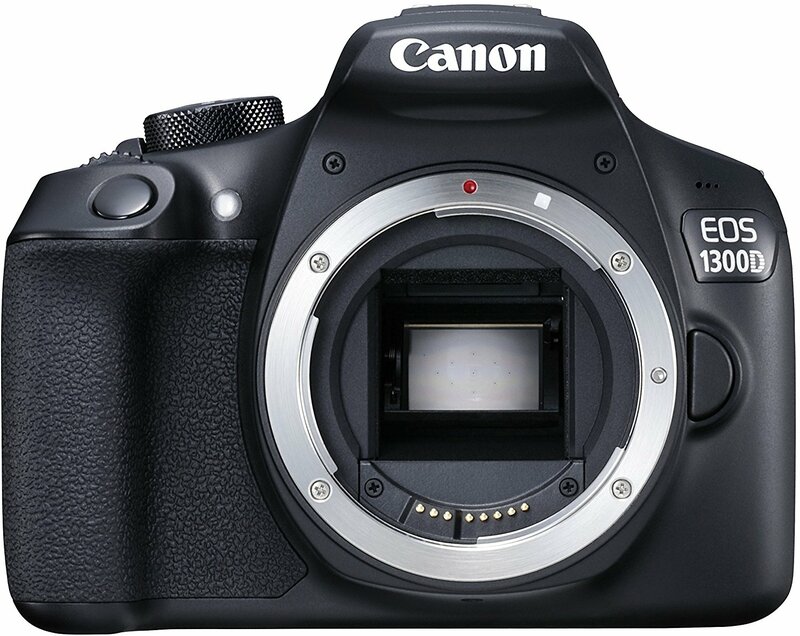 The Canon EOS 1300D works with a LP-E10 LiIon battery. The battery lifetime is a generous 500 shots. Usually enough for a full day or more. 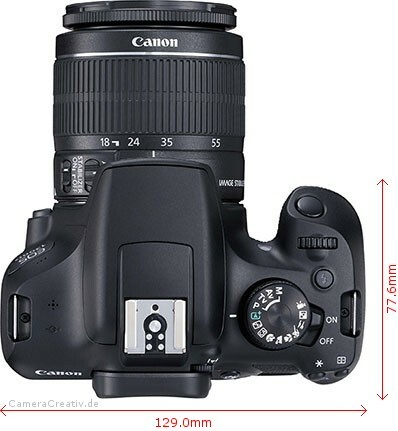 The Canon EOS 1300D's dimensions are 129.0 x 101.3 x 77.6mm³. (5.1" x 4.0" x 3.1"). That's the body only, without lens. The camera's weight is a reasonable 485 grams (15.6 oz.). Add to this the weight of the lens. 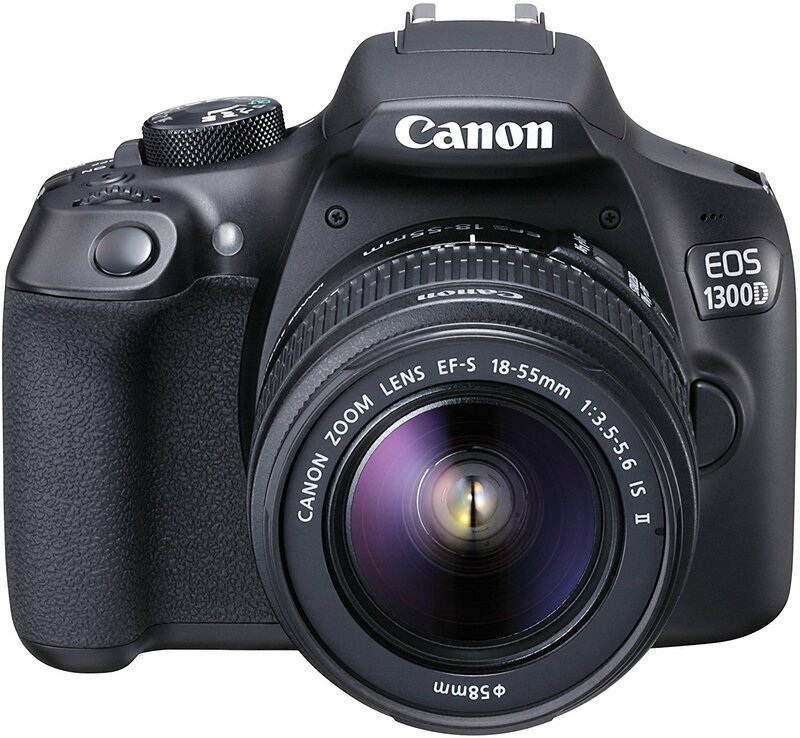 The Canon 1300D (in the US: Canon Rebel T6) is a typical entry level DSLR. Its APS-C sized sensor provides 18 megapixel resolution, easily enough for prints sized A3 or larger. The camera features WiFi and NFC and can be controlled remotely from your smartphone or PC/Mac. On the plus side are low price, easy handling and Canon's vast lineup of compatible lenses. Drawbacks are the inferior autofocus with only nine focus points (one cross sensor) and the rather smallish (0.5x) penta mirror viewfinder. Recommended as a spare for vacation and the like and for people who want to upgrade from point & shoot cameras or smartphone photography.